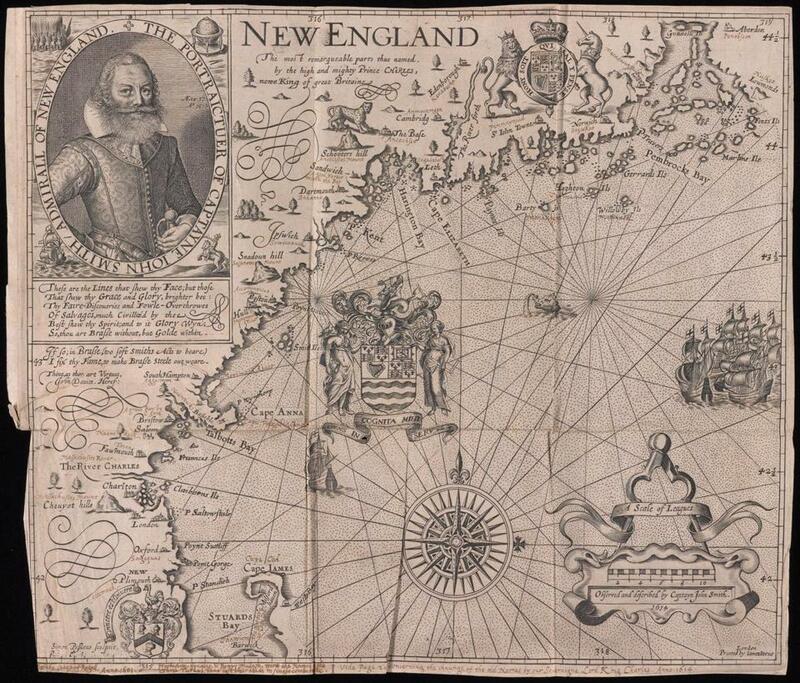 Smith’s map of New England: Good luck trying to visit London, Mass. Exactly 400 years ago this month, a small boat plied the coastline of Massachusetts with a few English explorers on board. Among them was one of the most familiar names in early American history: Captain John Smith. Smith is not normally associated with New England—he’s known to history as one of the English cofounders of Jamestown, in Virginia. But in 1614, after a dramatic decline in his personal fortunes, he found himself in new waters, researching a map that changed American history. At first glance, Smith’s map looks like what you’d expect for the period: a roughly accurate picture of the New England coast, populated by little British towns. But in fact, this is one of the strangest documents from the age of exploration. Much of it is fictitious, and deliberately so. It renamed the region and filled it in with Smith’s own vision of New England’s destiny. Today it offers a stark example of what scholars see as the many uses of cartography: that a map can do many more things than document a place. It can also chart the course of the future. Five years before this expedition, Smith had been all but driven out of Virginia by his social betters, who resented a young upstart son of a yeoman farmer ordering them around. After a gunpowder accident that sent him back to England, Smith nursed his wounds, both physical and emotional, and plotted a comeback. He found it in a mission funded by several London merchants to take two ships and explore the area known as “North Virginia,” in order to catch some whales and see if he could find any gold there. At the time, the area was known by many other names, including Pemaquid and Norumbega, and only a few sketchy maps had been made of the coastline. While ostensibly his trip was only for reconnaissance, Smith had a secret plan in mind: the founding of a new colony that would correct the mistakes he felt had been made in Virginia—and at the same time, correct his own expulsion from that colony by recognizing him as its leader. Finally, the map is richly populated with English villages, including London, Oxford, Cambridge, Dartmouth, and Ipswich. What Smith had actually found on his expedition was a scattering of Indian settlements, identified to him by local guides. The map’s place names were cooked up by the 15-year-old crown prince of England, Charles, to whom Smith had submitted the map, asking him to replace the local names with suitable English ones. It wasn’t the first map to bend the truth—on a map of “New France” at the same time, Samuel de Champlain depicted Quebec as a castle, when in reality it was only a fort of less than 200 people. But the scale of Smith’s fictitious landscape was an unprecedented act of virtual colonization, drawn before a single permanent English settlement had been founded. In the text accompanying the map, “A Description of New England,” Smith lays bare his colonial aims, stating, “could I have but meanes to transport a Colonie, I would rather live here then any where....Here every man may be master and owner of his owne labour and land.” Later scholars saw these words as the first articulation of the American Dream, where a new society based on merit would supplant the old English aristocracy. In modern map studies, cartography scholars have begun to analyze maps as more than simple attempts to mirror reality; every map also offers clues as to the intent and agenda of its maker. Even in the age of GPS and satellite views, a map represents a choice about what to show within its boundaries, and thus a kind of statement about how its viewer is expected to see the world. A map can be seen as a story, with an author, a theme, and even a “tense”—does it show the past, or try to document the present? Smith’s map is emphatically in the future tense, telling a story about a New England that did not yet exist, but could. The tacked-on English place names perfectly fit Smith’s attempts to colonize the land for England—and for himself. That theme of colonization is further made clear in a dozen ways, including the depiction of the land as a wide-open parkland rather than the wilderness it was, the coats of arms of the British Crown and the Council for New England, and the flotilla of ships bearing the English cross sailing from the east. The map continued to set a precedent for future map makers in preemptively claiming territory for England—and later for the United States—as colonization spread further westward across native territory. Smith’s personal dreams never came to pass: Heading back on another voyage to colonize New England with 16 settlers in 1615, he was captured by French pirates and held prisoner for months. Though he eventually returned to England, he was never again able to get together funds for an expedition to the New World. But the story of his map did come true, when it was carried by the Pilgrims aboard the Mayflower as they set sail from Plymouth in 1620. They settled in a location that Smith had designated as “Plimouth,” adopting the name for their own colony. The first of his fictitious cities thus became a reality, and New England began to exist on land as well as on Smith’s audacious piece of paper. Michael Blanding is author of “The Map Thief: The Gripping Story of an Esteemed Rare-Map Dealer Who Made Millions Stealing Priceless Maps.” Follow him at www.michaelblanding.com. Correction: An earlier version of this story mistakenly described the direction from which English ships sailed on the map. They sailed from the east.